A new £1.4 million flagship projects competition was launched at the inaugural annual meeting for members of The UK Plastics Pact in London yesterday. The competition, which is managed by WRAP and in partnership with UK Research and Innovation (UKRI), was one of several announcements made at the Summit, and forms part of the £20 million Plastic Research and Innovation fund (PRIF). 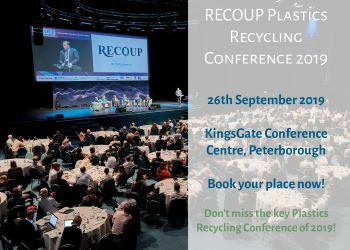 It will bring together Britain’s best scientists and innovators to help move the country towards more circular economic and sustainable approaches to plastics. Grants will be awarded under the ‘UK Circular Plastics Flagship Projects Competition’ to applicants who have creative business ideas to reduce the environmental impacts of plastics, and bring greater circularity of plastic use. UKRI executive chair, national environment research council and PRIF Duncan Wingham said: “The Plastics Research Innovation Fund brings the strength of UK Research and Innovation’s entire portfolio, from environment to technology to business to behaviour and regulation, to bear on the pressing and very widely recognised problem of plastic waste. The UK Circular Plastics Flagship Projects Competition is open to any UK business, and grants will be awarded between £100,000 and £500,000 subject to match-funding, to support the piloting and evaluation with a view of wider implementation. WRAP’s PlasticFlow 2025 Flow Data Report which details the current levels of UK plastic packaging on the market and the future levels up to 2025. Research on the minimum thickness of plastic bottles to be recycled and the assessment of light-weighting plastic bottles on the sorting and recycling stages. The research found that overall thin packaging was no more difficult to sort and recycle than thick packaging. However, it showed that for rigid PET bottles, there was a minimum thickness of 0.05mm, but this was only present in less than 2% of the sample. The most important part for effective sorting and recycling was how the bottles were presented; a bottle should be empty and flattened with the lid on. He added that it is a complex challenge and there is a need to get the balance right by retaining the value of plastic while reducing the effects of plastic waste. However, he said that the Summit has reinforced his confidence that it is possible to achieve this. The Summit was also a chance for delegates to focus on future work under the UK Plastics Pact, with a draft of the forthcoming UK Plastics Pact Roadmap shared ahead of publication. This sets out the key actions and intermediate milestones businesses, and other members will need to achieve to deliver each target by 2025, as well as highlight the challenges ahead. The UK Plastics Pact Roadmap is due to be published later this year, and will also inform action by Governments, funders, investors, NGOs and businesses who are not members of The UK Plastics Pact.